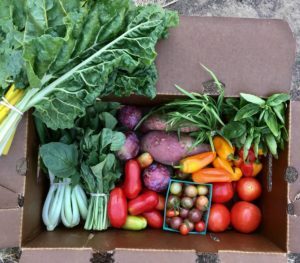 Supporting local food growers through a direct-to-consumer CSA program allows customers to enjoy highly-nutritious produce, meats, dairy and other farm goods. Members can pick up harvest shares at a communal location or have them delivered directly. Exposure to new varieties of local fruits and vegetables. Produce is often picked within 24 hours of delivery. Learn new ways of cooking. Many boxes include recipe cards! You support your local economy. Check out the list of CSA’s that delivery in your area and start receiving nutritious, delicious, farm-fresh foods grow by a local farmer! Tara Firma Farm Pasture raised beef, pork, chicken,lamb, and turkey. Organic fruit, eggs, cheese, and vegetables. Offering home delivery anywhere in California! Drop location in Benicia. The Cloverleaf Farm Fruit-only CSA offering peaches, strawberries, blackberries, nectarines, apricots, watermelons, cantaloupes, and figs. Drop locations in Davis, Winters, Oakland and Sacramento. This program is supported through financial contributions from our CSA members and generous funding from the Foundation for Sustainability and Innovation.